Taking off the kid gloves? Legal Advisor for Judea and Samaria gives OK to fire at the attacker in life-threatening situations. 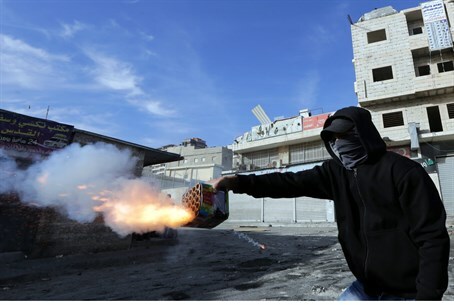 The Legal Advisor for the IDF's Judea and Samaria Division, Colonel Doron Ben Barak, has given soldiers permission to use live fire against rioters who attack them with fireworks, if the fireworks endanger their lives. "There are circumstances in which aiming a firework directly at a soldier from close range may create a real and immediate danger to his life, efficient defense against which may certainly require opening live fire against the person who fired the fireworks,” determined the advisor. Even when there is no direct danger to the soldiers' life – when he is inside a pillbox position or when the fireworks are not aimed directly at him – he may, from now on, carry out the Procedure for Arresting a Suspect. This involves shouting out a warning, firing in the air and then firing at the suspect. According to IDF weekly Bamahane, the decision reflects a change in the IDF's attitude toward fireworks, which were treated as being in the same weapon category as rocks until now. “It can be estimated that as time goes by, there will be increased use in the fireworks' propellant material for hostile terror activity, because it is readily available and cheap,” said another source. Bamahane reported there are 20 cases of hostile use of fireworks against soldiers or civilians in Central Command, and that the frequency of these attacks is growing.